Since I am not proficient in all technology trends, the rising popularity of virtualization was not something I could quickly wrap my head around. When I hear the word “virtualization” I think of “virtual reality” games and training. Wikipedia’s definition of “virtual reality” is: “a term that applies to computer-simulated environments that can simulate physical presence in places in the real world”. So I then deducted that “virtualizing a server” was something along the lines of using a virtual server to do the job of a physical server when the physical one was not available. While I was happy with my conclusion, I had to know if I was right. I sat down with Scott Gondesen, our Director of Client Services, and grilled him on the topic. It turns out, my assumption was fairly correct, and I got even more information on virtualization which I am glad to now share with you. Scott, there’s been a recent buzz in the business world about server virtualization. What does it mean to virtualize a server? Virtualizing a server is basically taking a physical server and creating an electronic version of it or a Virtual Machine. A physical host server is setup that can run multiple Virtual Machines. Ok, so what are the major advantages of virtualization? Virtualization offers many advantages over running independent physical machines. Many times software is spread across multiple servers not because of resource limitations but to avoid conflicts between the applications. By virtualizing the servers you can run multiple servers from a single physical box. For example: Instead of buying a physical server for Microsoft Exchange and another physical server for Blackberry Enterprise Server you can simply buy one server and set it up as a VM Host, then run the virtual instances of both the Exchange and BES from the single host. Fewer physical boxes results in lower equipment and operation costs as well as conserving space through consolidation. Virtualization also offers companies a way to implement redundancy without purchasing additional hardware. Other benefits include: Simple backup and disaster recovery solutions, aid in testing and development, and to centralize server administration. Why do you think it is becoming such a hot topic now? Hardware resources (processing power/memory) have increased faster than software resource demand. 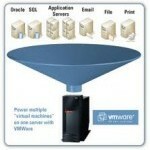 It makes sense economically to Virtualize. Virtualization is a cost effective solution that has many great benefits and is easier to implement now than ever. Hmm, that is really interesting. Are there any disadvantages though that people should be aware of before virtualizing? Aside from requiring new skills that the current administrator may not have the biggest drawback to virtualization is a single hardware failure can bring down multiple servers. If you have a VM host running four of you main production servers and the motherboard dies, your four production servers are now dead as well. Of course with redundant systems in place it would not be an issue. Having a single point of failure for multiple servers is probably one of the biggest items to be taken in to consideration when planning to virtualize. Doing your homework during the planning phase will definitely pay off years down the road. This “interview” with Scott really helped me fill in the gaps of my understanding of virtualization. I hope you feel better informed as well. If you have any questions or would like further information about virtualization, please visit 3coast or email us at info@3coast.com.